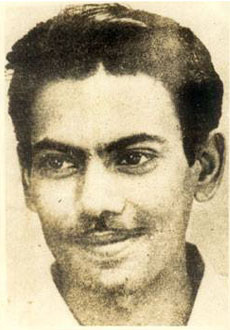 Zahir Raihan (August 19, 1935 – January 30, 1972) was a Bangladeshi novelist, writer and filmmaker. He is perhaps best known for his documentary Stop Genocide made during the Bangladesh Liberation War. Zahir Raihan was born on 19 August 1935, as Mohammad Zahirullah, in the village Majupur, now in Feni District, Bangladesh. After the Partition of Bengal in 1947, he, along with his parents, returned to his village from Calcutta. He obtained Bachelor of Arts (Honours) in Bengali from Dhaka University. He had been married twice, to Sumita Devi in 1961 and Shuchonda in 1968, both of whom were film actresses. Zahir Raihan received his post graduate degree in Bengali Literature. Along with literature works Raihan started working as a journalist when he joined Juger Alo in 1950..Later he also worked in newspapers, namely Khapchhara, Jantrik, and Cinema. He also worked as the editor of Probaho in 1956. His first collection of short stories, titled Suryagrahan, was published in 1955. He worked as an assistant in the film Jago Huya Sabera in 1957. This was his first foot print in film. He also assisted Salahuddin in the film Je Nodi Morupothay. The filmmaker Ehtesham also took him for his movie A Desh Tomar Amar, for which he wrote the title song. In 1960 he arrived as a director with his film Kokhono Asheni. In 1964, he made Pakistan's first colour movie, Sangam, and completed his first CinemaScope movie, Bahana, the following year. He was an active worker of the Language Movement of 1952 and was present at the historical meeting of Amtala on February 21, 1952. The effect of language movement was so high on him that he made his legendary film "Jibon Theke Neya" based on it. He also took part in the "Gano Obhyuthyan" in 1969. In 1971 he joined in the Liberation War of Bangladesh and created documentary films on this great event. During the war of liberation Raihan went to Kolkata where his film "Jibon Theke Neya" were shown. His film was highly acclaimed by Satyajit Ray, Mrinal Sen, Tapan Sinha and Ritwik Ghatak. Though he had his financial problem going on that time, he gave all his money to the Freedom Fighters trust that he got from the show. Raihan disappeared on January 30, 1972 trying to locate his brother, the famous writer Shahidullah Kaiser, who was captured and killed by the Pakistan army and/or local collaborators during the final days of the liberation war. It is believed that he was killed with many others when armed Bihari collaborators and soldiers of Pakistan Army in hiding fired on them when they went to Mirpur, a suburb of the capital city of Dhaka that was one of few strongholds for Pakistani/Bihari collaborators at that time. •	"A State is Born"